Dina has had many years of footballing experience, both as a player and a coach. As a child, she started training in the Australasian Soccer Academy and played only one season at club football level before being signed to National Premier League 2 further working her way through to National Premier League 1. She has also represented NSW City in the National Titles Football Tournament receiving the Golden Glove award. Dina’s goalkeeping training started at a young age under the guidance of the former Czech Republican goalkeeper Bruno and the International Goalkeepers Academy by Jim Fraser. She has had the experience of coaching teams from grassroots levels all the way through to All Age Women’s and even Men’s Premier League whilst providing specific goalkeeper training to goalkeepers of the clubs. 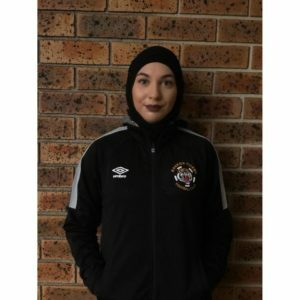 Dina now plays for Banksia Tigers Women’s Premier League. (c) 2014 Banksia Tigers FC "Come Play the Banksia Way"